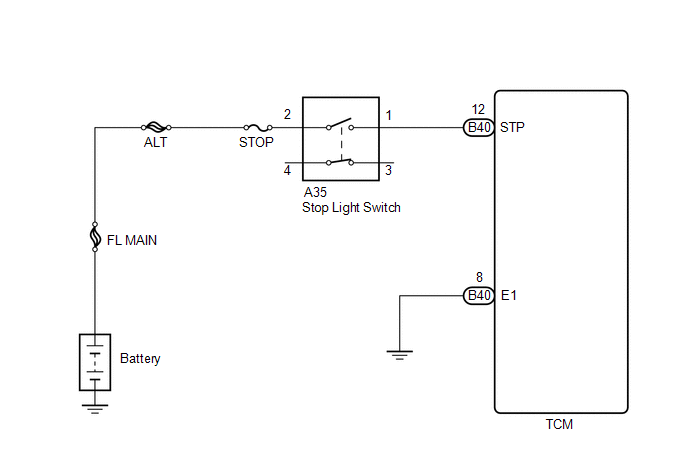 The purpose of this circuit is to prevent the engine from stalling when the brakes are suddenly applied while driving in the lock-up condition. When the brake pedal is depressed, this switch sends a signal to the TCM. Then the TCM cancels the operation of the lock-up clutch while braking is in progress. The stop light switch remains ON even when the vehicle is driven in a STOP (less than 3 km/h (2 mph)) and GO (30 km/h (19 mph) or more) fashion 5 times. (2-trip detection logic). This DTC indicates that the stop light switch remains ON. When the stop light switch remains ON during "stop and go" driving, the TCM interprets this as a fault in the stop light switch, illuminates the MIL, and stores the DTC. The vehicle must stop (less than 3 km/h (2 mph)) and go (30 km/h (19 mph) or more) five times for two consecutive driving cycles in order to set this DTC. (e) Enter the following menus: Powertrain / ECT / Data List. (f) According to the display on the Techstream, read the Data List. In the table above, the conditions listed under "Normal Condition" are reference conditions. Do not depend solely on these reference conditions when deciding whether a part is faulty. (a) Check the stop light switch assembly installation (See page ). 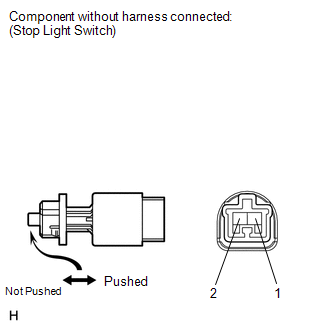 Stop light switch assembly is installed correctly. 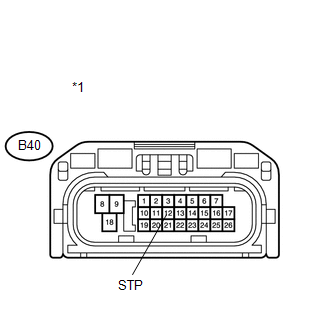 (a) Remove the stop light switch assembly. (a) Install the stop light switch assembly. (b) Connect the stop light switch connector. (c) Disconnect the TCM connector. (d) Measure the voltage according to the value(s) in the table below when the brake pedal is depressed and released.